Kuzukiri is one of popular Japanese Sweets in summer. 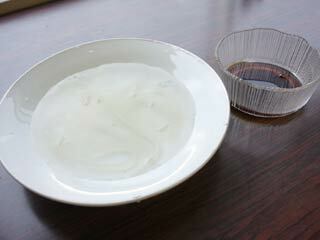 It made from Kuzu Powder (a starch powder made from Kuzu). and Sugar. Because it served with ice water, people love to eat this in summer. Add, 10g of suger on 100g of Kuzu Powder. Prepare a small pan like this. Pour one or two scoops of Kuzu. Then heat it with boiled water. Once, its color changed to clear, that's it. Cool it down with water, then remove it from the pan. Slice it into long thin strips. Put them into water with ice. You can cut them into your favorite size. That's it for making Kuzukiri!